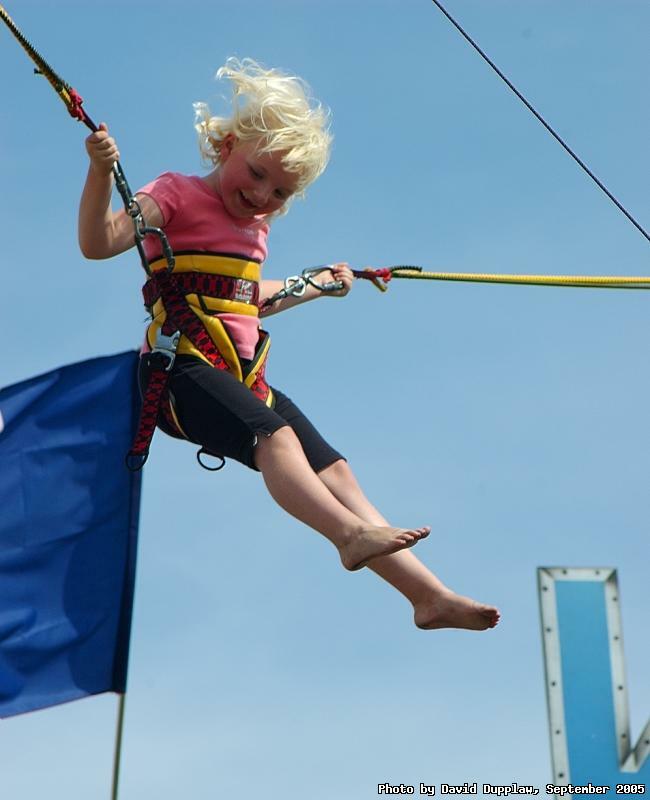 Taken at the Great Dorset Steam Fair 2005, I spotted this little girl having great fun on the bungee trampolines. I think the photo captures her excitement very well, despite the interference of that blue flag. Almost no alterations have taken place; just a little cropping and a touch of curves. As any photographer knows, whether or not to take photos of people, particularly other peoples children, in public places can be a mind numbing decision to make. It took me a while, and some persuasion from my wife, to actually take this photo, and a similar argument with myself about posting it. I did not gain any permission for either. I would be interested in hearing others opinions if this is considered ok. My usual thoughts are that if the person is unrecognisable then it is ok, but this does not fit that. So, I see it as a charming photo of a little girl having much fun and I hope others do too. If it is deemed unnacceptable it is easy to remove!